PwC’s Strategy+Business website has an article titled “Creating a Strategy That Works” that came out with Five Key Practices after studying 14 leading companies in various countries and industries. It pointed out how these five unconventional acts differ from the conventional business wisdom. These five unconventional wisdom supports the teaching of Sun Zi’s Art of War. Furthermore, Sun Zi’s Art of War provides a better framework and additional wisdom that demands our study. PwC’s Strategy+Business website has an article titled “Creating a Strategy That Works“. It compared the conventional business wisdom against the unconventional acts of the leaders in the various industries and countries. I like to examine such business strategic articles and books, e.g. Playing to Win: How Strategy Really Works, or Managing in a Time of Great Change, against the teaching of Sun Zi’s Art of War to see if the Art of War is still applicable to business and whether there are additional wisdom to be gained from both, the modern Western management thinking and the ancient Chinese wisdom. The two key words are Jesus’ Words and Doing them. They can be translated into modern business practices as the right Way (Sun Zi’s Dao 道) and then the adopting and execution of them, which means the right culture. Culture is the actual values and behavior adopted by the people. The most successful example of the adoption of the right culture, the mission, and its practice, is Apple Inc. See What and Who has the Best Mission Statement? 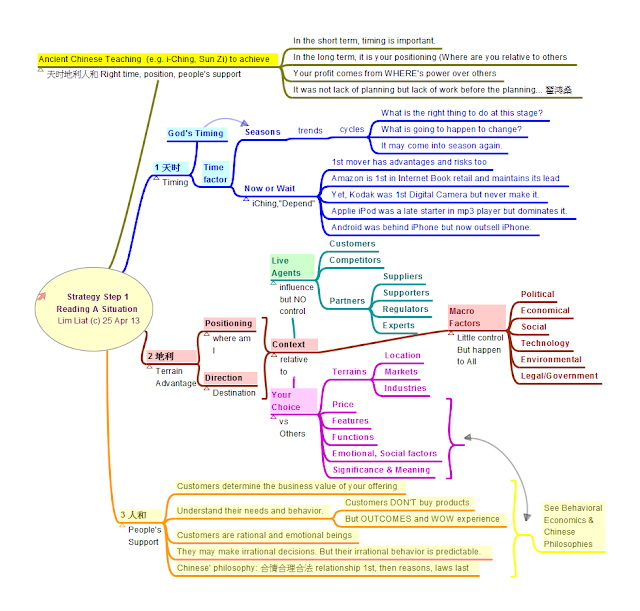 I hope you can see that modern management books continue to support the teaching of Sun Zi’s Art of War. The Art of War gives a more comprehensive and condensed teachings on not only developing the better-winning strategy but also the leadership skills to execute them. Who has the Best Mission statement? A mission statement is about the purpose of your existence. It is your identity and the value that you provide to a particular group of people. It gives meaning. It should be inspiring. It differs from Vision statements. Mission is about why whereas Vision is about what at some future point in time. Vision explains what your mission looks like to internal and external people. Values are your key believes that shape your decisions and behaviors; those important qualities and moral standards that define who your are. Getting back to mission, a mission statement must also be inspiring. If you want to build a ship, don’t just drum up the men to gather wood, divide the work and give orders. Instead inspire them to yearn to set sail for the endless sea. He further said that if the society can be inspired to set sail for sea, then an Asian Silicon Valley will appear. Hence, we can see the importance of the inspiration in a mission statement. It is of course very sad to see most companies, even the large listed companies, have mission statements that are vanilla statements of what they do. They are just making a living rather than impacting the world. In Sun Zi’s Art of War, the first of the five factors for winning war is 道 Dao, the mission and values of the people. Sun Zi explained Dao as the one that unite the top and the bottom so that they can bravely live or die together. Unity is one of the 5 keys for winning that he emphasized again in the later chapters of his book. 是 以 圣 人 处 无 为 之 事 行 不 言 之 教. Therefore, the saints do things that violate not the nature order. They are to teach without words (i.e. teach by examples. The exhortation is not about not to teach, but to teach rightly, by being the model for others to follow). This teaching without words is repeated in Chapter 43. The mission is not taught but caught and is shown in the way the staff work and in the products and services that they offer. But once the mission is internalized, there is no need to state it explicitly. Mission statement must be implemented in the company policies, procedures, practices and systems. Also in the building design, office layout, retail space deco, the vehicles and everything else. It takes time and effort for the staff to internalize the mission and for the mission to be entrenched in all the practices. In the long run, it creates the unique culture that give its the competitive strengths. Technologies can be bought, practices can be copied, but culture cannot be easily copied. Customers tell you your real mission. The mission best shown in the products and services that the company offer to its customers. Customers are the ones to tell you accurately and truly about your mission. 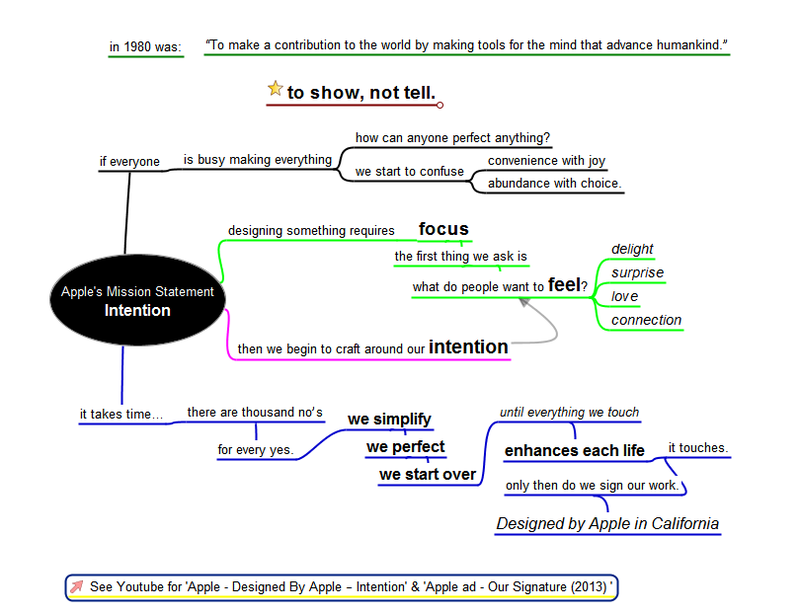 What is the Apple mission statement? What words come to your mind when you think about Apple? Your true mission is not what you say but what customers say! Apple’s mission can be found, indirectly, in Youtube videos on “Apple – Design by Apple – Intention” and “Apple Ad – Our Signature”. Apple called their mission statement, intention and signature. Indeed, your signature is your identity which is also your mission. Notice that the value that customers appreciate is in how they feel about your products and services. It is all about creating a wow experience that get the customers to ask for more! The best form of leadership, for this VUCAD world, one that is adaptive and sustainable over time, is leaderless. But you don’t get that kind of leadership overnight. It can only be built overtime with right people and a simple principle of remaining leaderless. Surprised? Read the details…. Who should Microsoft choose to be the next CEO? Some one that can compete with Google and Apple ? No says Ancient Chinese Wisdom Book I-Ching. An Invisible Leader says Lao Zi. Lou Gerstner who saved and transformed the ailing IBM says, “It is the culture only”. So, pick someone who can build the self-managed leaderless culture. What is the highest form of leadership? According to I-Ching, the Book of Change, it is leaderless. 乾元“用九”，天下治也。Heaven/Creation is great. Use Nine and the world is ruled well. 乾元“用九”，乃见天则。Heaven/Creation is great. Use Nine is the model of the rule of heaven. So we can see that the best or the good fortune stage of an organization is leaderless. dragons : more accurately, mature dragons that went through the six stages of growth. They are independent persons with good virtue of character and ability. without a chief: There is no one designated as the chief or commander to direct others around. The people know what to do for the good of the organization. When face a crisis, may be the best person to handle it will take the lead and others will contribute according to their best abilities. When the situation changes, previous leader hand over to the next one who is most able to do the leading. He that is able takes the lead is the leadership model of the Ancient China before formation of Dynasty when the kingship is handed to the son. Such leadership model ensures the organization always has the best person to run it. It is self-renewal. Such a high performing self-managed and self-sustained organization does not come just like that. They must fulfill the 3 criteria listed above, namely, an organization, dragons, without a chief. Shared Mission & Values: An organization or a grouping of people must have common mission and values as the glue to bring and hold them together. Dragons – Talents Development. We need to hire and develop the talents and make sure they grow up in character and ability. In I-Ching, we can find the details those qualities and know-hows in the 64 Hexagrams and 386 stage lines of wisdom. Leaderless – The Best One Lead: The organization needs to have a simple rule on leadership. There is no fixed leader under normal operation. When there is a crisis or a need, then the most able one to address the need take over as the leader. When the issue is solved or resolved, the leader steps down and the group return to leaderless mode. The important one to note is that such a flexible self-manage organization needs to be built over time. But we now have the guidelines to build such an organization. In the present commercial world, there are more and more organizations adopting such a self-management model. The most popular one is The MorningStar Tomato Company http://morningstarco.com/index.cgi?Page=Self-Management. See also Levels of Leadership – Can We Measure Leadership?, where Lao Zi tells us the highest level of leadership is the invisible leader. This also shows Lao Zi’s actionless principle in action. See The Tao Bible in One minute . If you are still doubtful, consider the purpose of parenting. The job of parents is to develop their children from dependence to independent mature adults. The job of CEO is then about developing their staff to be capable and engaged staff so that they can be independent and yet co-operative staff to achieve the mission of the organization. The most important step in any strategic planning is to read or study the situation first. But before we can read, we must know what are the important factors to consider first. Presented in the mind-map is the methodology integrated from the teachings of East (Chinese) and West. You may follow it to get a better strategic plan. Sun Zi’s Art of War is a famous Ancient Chinese Book in the west. It is much less know fact that Sun Zi’s wisdom has an earlier and higher source. It is the book of i-Ching (see I-Ching in One Minute), the Bible for Change, the foundation of all Chinese wisdom and philosophies. But such great wisdom will be of no use if we cannot put them into good use in this present world. 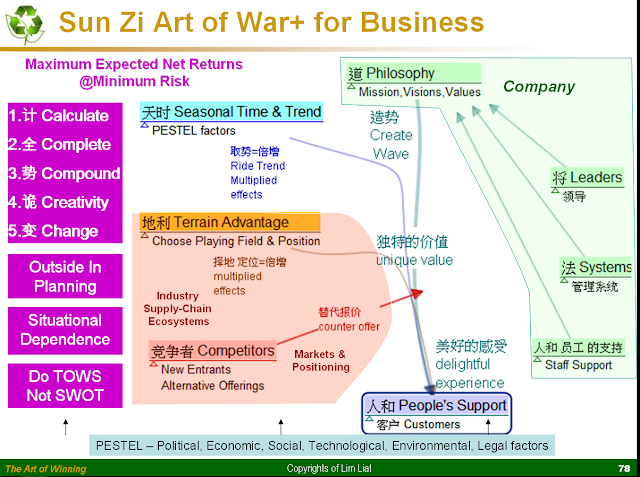 With a view from building successful and long lasting businesses, instead of wars, here is an attempt to bring the East and West wisdom into strategic planning for business. 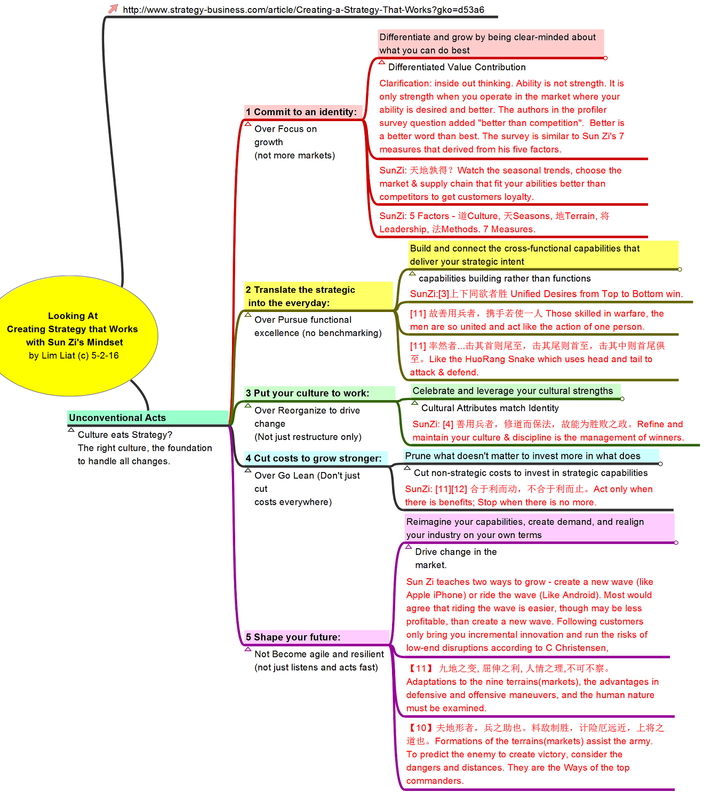 Only a very little part of the Ancient Chinese Wisdom is cited here due to limited space of a blog post. But I hope it serves the purpose of helping you to do a better strategic plan. More practical Chinese wisdom can be found at Ancient Chinese Wisdom.